As the river flows along flatter ground, it slows down and erodes more sideways than downwards, forming bends called meanders. Water on the outer edge of the bend has further to travel than water flowing on the inside so it speeds up and has more energy for eroding and cutting into the bank. Water flowing on the inside of the bend slows down so it drops its load of: silt, sand and stones, depositing material in a mini beach. Over time, the meanders extend further and further, creating a wide, flat valley called a flood plain. 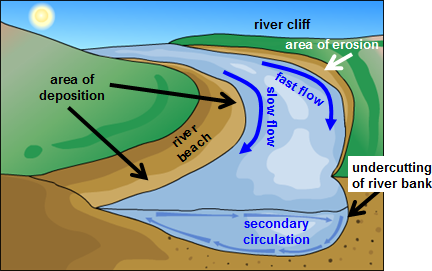 Where meanders loop back on each other very tightly, the neck separating two loops may be completely eroded and the river may create a new, straight channel. The old loop that is left alongside is called an oxbow lake.